In an effort to address real-world sustainability challenges, establish sustainability as one of its core values, and establish best practices in sustainable campus operations, Lawrence University is looking to transform itself into a living laboratory through a series of new institutional initiatives. Project specialist Kelsey McCormick will serve as Lawrence’s new sustainability coordinator and will co-chair a newly formed sustainability subcommittee with Jeff Clark, professor of geology, who is also serving as special assistant to the president for sustainability. A major focus of the new initiative will involve the establishment of an “Eco-rep” program designed to engage students in hands-on efforts in the residence halls to build a culture of sustainability, drastically decreasing the university’s environmental footprint in the process. Eco-reps will lead by example and educate their peers on issues ranging from recycling and composting to water and energy consumption to food systems, transportation and consumer choices. Lawrence also will establish a “Sustainability Institute,” providing faculty with opportunities to deepen their understanding of sustainability issues and incorporate sustainability concepts into the curriculum. The institute will run for two years with as many as eight participants each year, increasing opportunities for faculty to work with students to create new engaged learning experiences. These new efforts are made possible by a three-year grant from Margaret A. Cargill Philanthropies. The funding will support leadership opportunities for students, professional development opportunities for faculty and infrastructural improvements to the campus. In addition, part of the grant will be used for a special fund for Lawrence community members to seek support for sustainability-focused projects connected to classes, research or co-curricular programs. During each year of the grant, Lawrence plans to embark on one major infrastructural improvement with the intended goal of reducing the environmental impact, improving efficiency, and reducing waste, which ultimately should lead to cost savings in the long run. 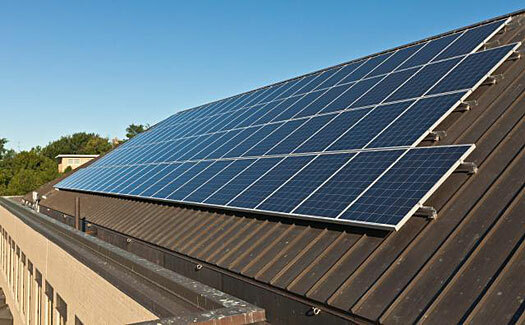 Solar panels on the roof of Hiett Hall are one of the efforts Lawrence already has undertaken to become a more sustainable institution. Lawrence also will launch a Community Read Program to encourage campus members to read and discuss a common book on a current sustainability topic as a way to engage students with others in the community over these global challenges. As a part of Lawrence’s strategic plan, Veritas Est Lux, the university is committed to enhancing “a culture of sustainable living by integrating sustainability goals across all aspects of the Lawrence experience.” Lawrence aims to be a steward of the surrounding community and the environment by preparing students to be responsible citizens of the world.